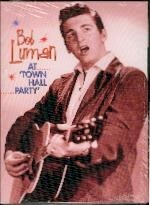 Produktinformationen "LUMAN, BOB - At Town Hall Party DVD"
'Town Hall Party' was among the first of the country music shows to be seen on U.S. television, making its debut in early 1952 and running until early 1961. Staged every Saturday in a theatre in Compton, a suburb of Los Angeles, the stage was made up to look like an old barn, thus continuing the traditions of the various live shows that were first heard on the radio airwaves three decades earlier. 'Town Hall Party' was created with its own cast of regular performers and musicians, boasting a house that was virtually a 'who's who' of the West Coast scene comprising such as Joe Maphis, Merle Travis, Skeets McDonald, Johnny Bond and Tommy Duncan. Jay Stewart (who later hosted the TV quiz show 'Let's Make A Deal'), and Tex Ritter were the MCs. The weekly show presented an equally impressive guest list. Among the many guests to appear were Johnny Cash, Patsy Cline, Eddie Cochran, The Collins Kids, Freddie Hart, Wanda Jackson, George Jones, Merle Lindsay, Bob Luman, Carl Perkins, Jim Reeves, Marty Robbins, Hank Snow and Gene Vincent. Weiterführende Links zu "LUMAN, BOB - At Town Hall Party DVD"